As I write this, it has just been revealed that there are 700,000 podcasts in the Apple Podcasts directory. Despite the fact that this is still low compared to the 50 million+ blogs in the world, the rate at which the number of creators is growing is startling and this will only continue, as will the number of listeners enjoying the consumption of the medium, with the BBC predicting that listenership will quadruple over the next three years. The space we’re in is getting busier by the day both from a “competition” perspective and from a potential audience size perspective, which brings with it two things: a mass of opportunity and a mass of hard work. Podcasters more than ever before are wondering how to grow their show amongst all of the noise and this was only reinforced by my recent trip to Podfest in Orlando, run by my two good friends Chris Krimitsos and John Dennis, where during our exhibiting/sponsoring/speaking remit we’re afforded the chance to really listen to what podcasters are struggling with. How do I get more listeners for my show? This isn’t a new question, it’s the first question that any podcaster asks the second that they launch their show and answering that is getting harder and harder. The bottom line is pretty clear: focus your time on podcast marketing with at least a 50/50 split between that and content creation, in my opinion. 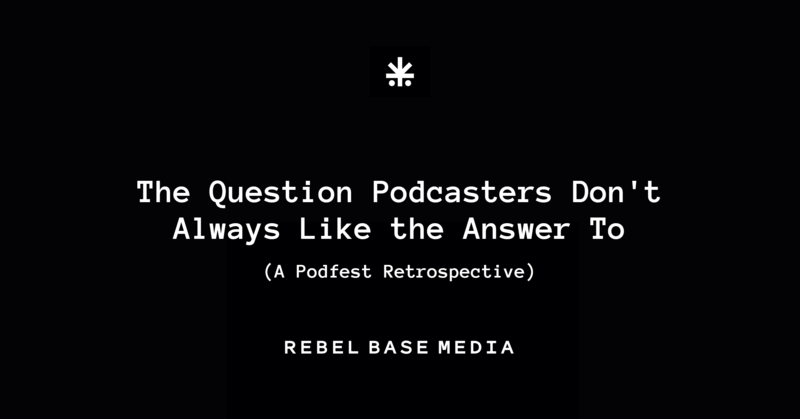 It’s an answer that any experienced podcaster will give you. The reason that this question becomes harder to answer year-on-year though is that many podcasters don’t want to hear that answer – they want an easy fix, a shortcut; they want the promise that “podcasting has never been easier” that they’ve been hearing everywhere to be fulfilled. That’s not to say that podcasters, especially newer ones, don’t want to put the work in – far from it. Rather, it’s the amount of time it’ll take to “get downloads that are big enough to sponsor” that they don’t want to hear about – podcasting is a long game for indie creators like us and success only comes through consistency, iteration, testing and being absolutely present for your audience. And it’s that last part that I want to leave you with: being absolutely present for your audience. As the space gets busier, the number of shows available to potential sponsors is growing and in the short-term, CPM values (the amount of money a sponsor pays you per thousand downloads of your episode) won’t go up because the inventory available to sponsors is abundant, it’s a buyer’s market right now and whilst that may change in the future (quality vs. quantity of shows) the goal for an independent podcaster should be to focus not just on growing download numbers but on growing their audio influence within a tight niche, building a small yet passionate following of core advocates who will help you to take your show to the next level. In short: your goal as a podcaster should be to become a personal brand, a trusted voice amongst the sea of voices with a method to identify those who are “with you” from those who are transient. Podcasting is about the people, it always has been, and it’s better to be something to someone than to be nothing to everyone. Podcasters, stay in your lane and make sure to spend time marketing your content to the people who respond to it – do more of what works, do that for a year with no deviation and watch how your audio influence and your audience naturally grows. People tell other people “like us” about great things in their space. Be one of those great things. Hey also, check out our latest Podfest vlog “The T-Shirts are in Memphis, Kieran” over on our YouTube channel.